I’m the kind of person that has a place for everything and everything in it’s place. Funny that God would give me a husband who couldn’t be any more polar opposite. Yin and yang I guess. I am however, very frugal and don’t like to spend much money on my organizing systems. You can tell by how very little I have spent on organizing my shower, necklaces, and belts. So when it came to shoe storage I new I needed to get thrifty and figure out a large storage solution that wasn’t going to cost an arm and a leg. 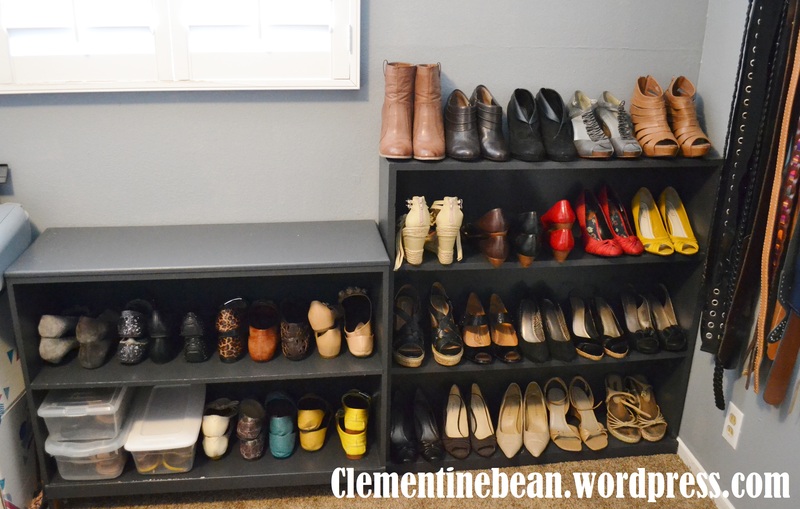 I used to organize my shoes in a hanging closet organizer from Ikea like this one, but once I started throwing all of my shoes in those compartments, not only did they get a little disorganized within each section, they were extremely heavy for such a lightweight organizer. It started to rip and bend under all the weight. That didn’t stop me from using it for a few years, but once we moved into our new place I new I wanted to try something different. We are blessed to have an extra bedroom in this house that we didn’t in our last apartment, which gives me more floor space for storage. 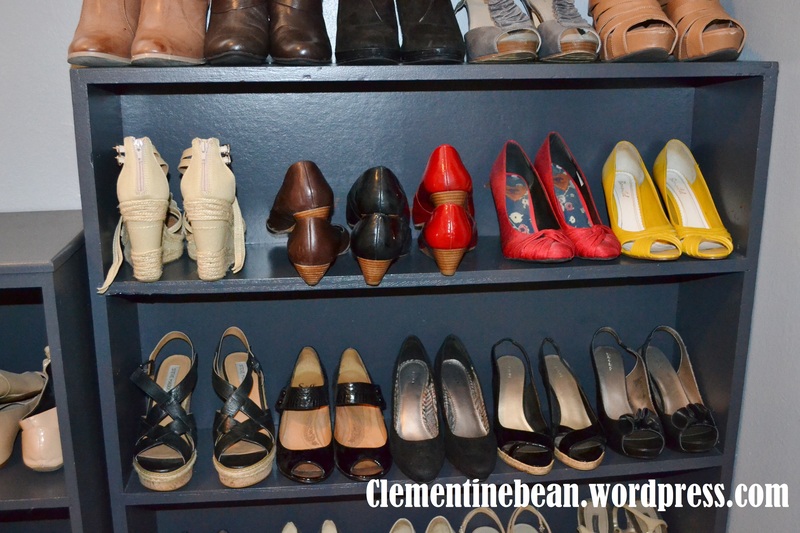 When we moved in, there were two old bookcases left behind and I knew they would be perfect for storing my shoes. I painted both of the bookshelves with a coat of dark grey paint that we used for the accent wall in our bedroom. This gave them a uniform look and helped them blend in with the rest of the room. I used the bookcase that has the deepest shelves to store my flats. 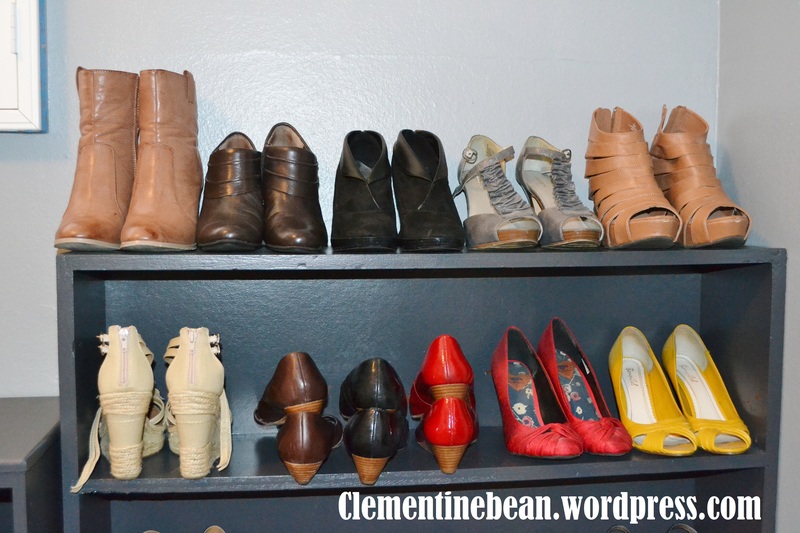 I organized them by color and kept shoes stacked on top of each other, versus side-by-side, to minimize the amount of space I used for each pair. 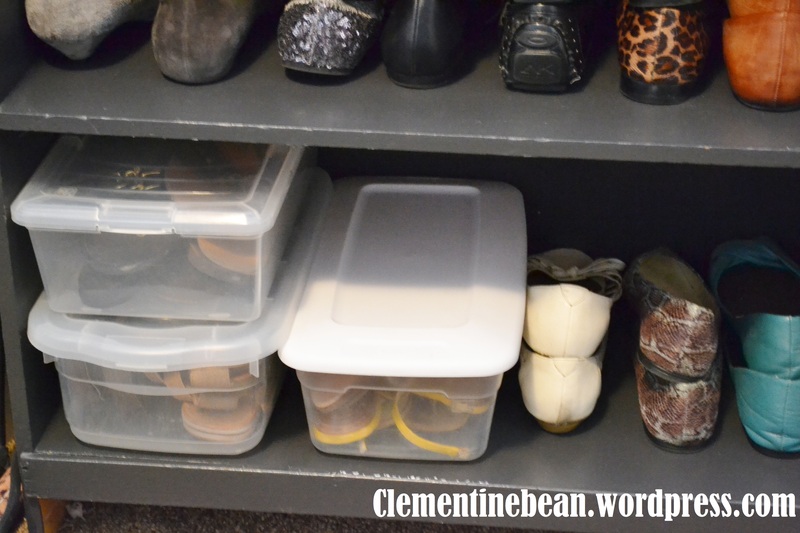 I used some old clear small storage boxes for all of my sandals/flip flops. I feel like sandals tend to get the messiest the quickest so keeping them in a few boxes prevents losing the matches or having them all over the shelves. Plus sandals hardly take up any space so putting a few in each box makes more sense then giving each pair a place on the shelf. You can tell that my second bookcase was much more narrow than the first, so it worked perfectly for my heels and wedges which aren’t as long as my flats. Again, I organized them somewhat by color and style. There’s no magic way to arrange shoes, just do something that makes sense to you. I put the tallest shoes on the top part of the bookcase to prevent them from being squished. 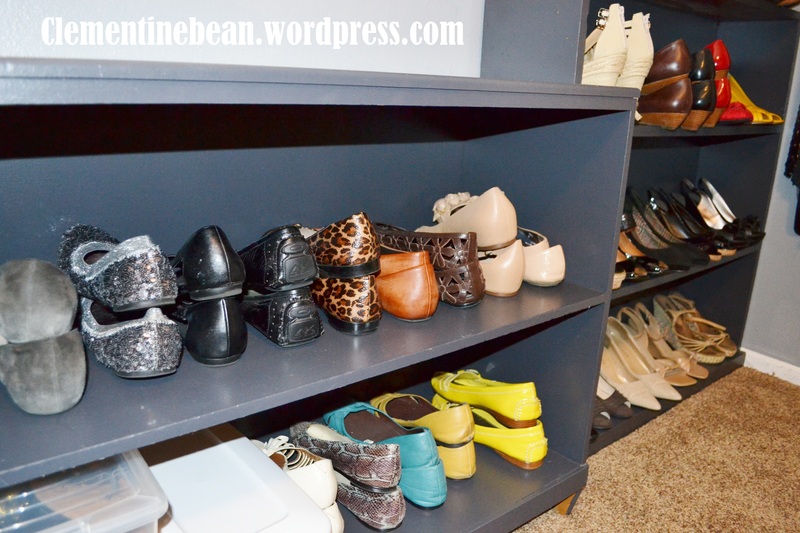 I used the rest of the area for all my remaining heels and wedges. Some of them side by side, and some of them stacked one on top of the other. It just depended on the style of shoe and how much room I had on the bookcase. Jeff, being the math brain that he is, figured out that if you face a pair of shoes with one shoe facing forward and one facing back, it actually takes up less space then putting both facing the same direction. I don’t have that pictured here, but if I end up acquiring more shoes and need more space, that will help make more room on the shelves. So there is my little shoe storage system. 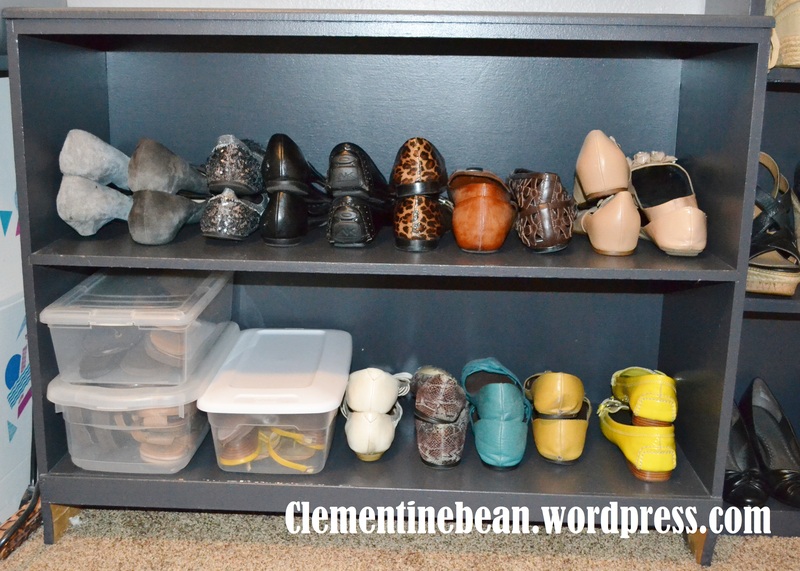 I keep my tall boots in the closet and I will share how I organize those on a different day. I actually really like having everything out on display. It’s really pretty to look at, plus it encourages me to wear pairs that normally would be at the bottom of a pile in my closet. 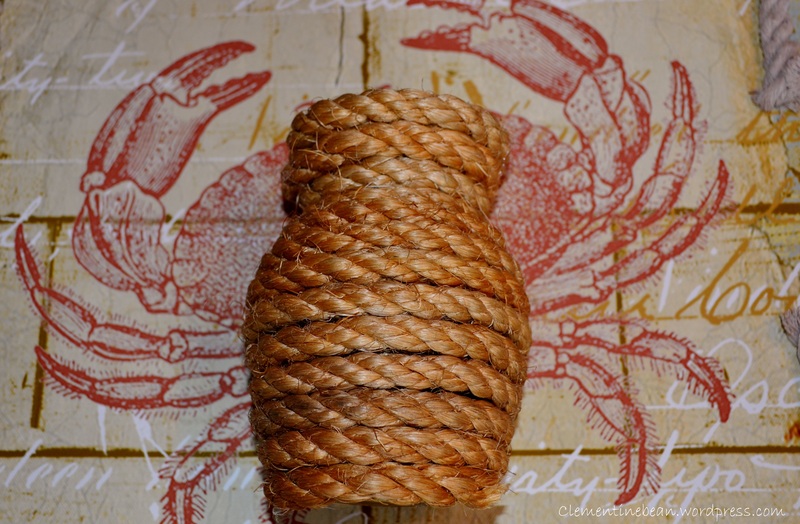 Remember last week when I gave you some ideas to use a rope for nautical decor? 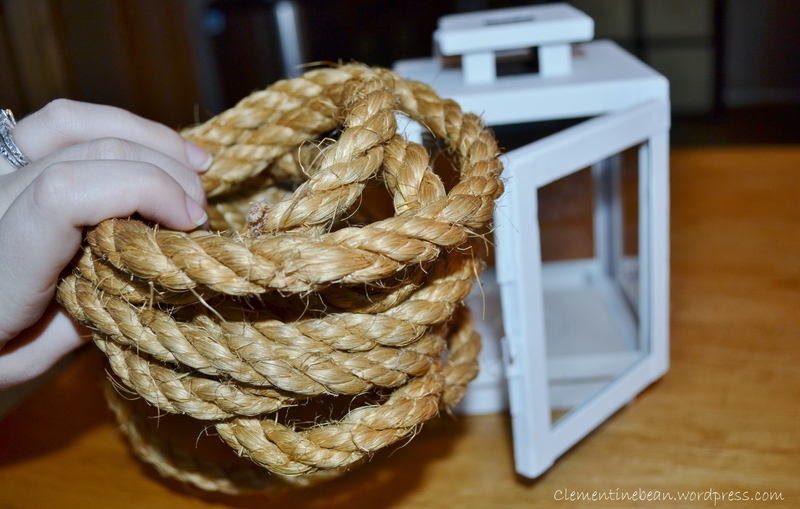 Well I wanted to show you how I ended up using the rope in my own home. I decided to turn it into a way to decorate an old vase. I picked up this vase at work in a box labeled “free stuff” a few months ago. Can’t go wrong with that! I knew the color didn’t match my home decor but thought it would be the perfect thing to experiment on once I thought of something I wanted to try. I got this piece of rope from my dad. Remember, it has a really significant history behind it. 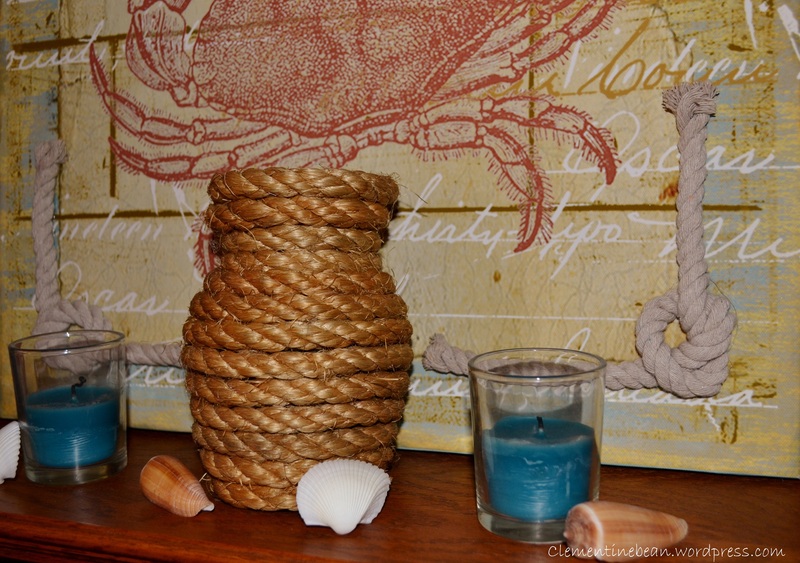 I decided I wanted to wrap the vase with the rope to fit into my nautical themed mantel. I just used a hot glue gun to attach the rope to the top of the vase. 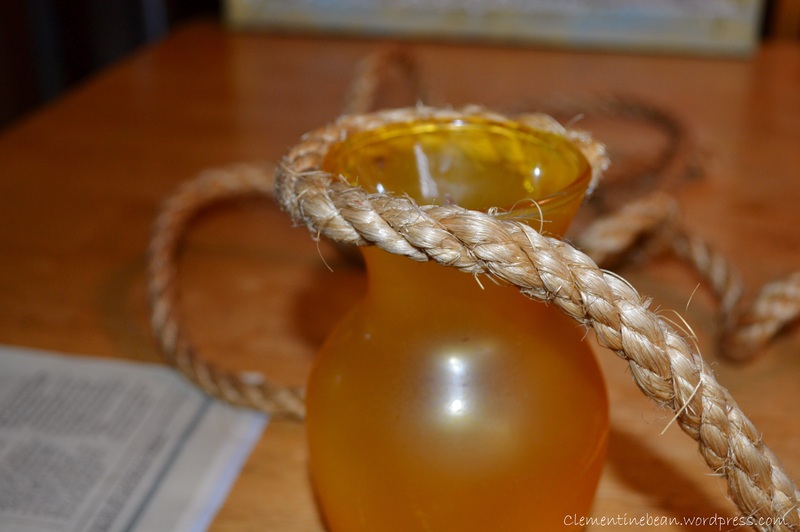 I glued the rope just slightly higher than the edge of the vase to conceal any of the colored glass. For the top row, I used glue almost all the way around to make sure it would stay in place. 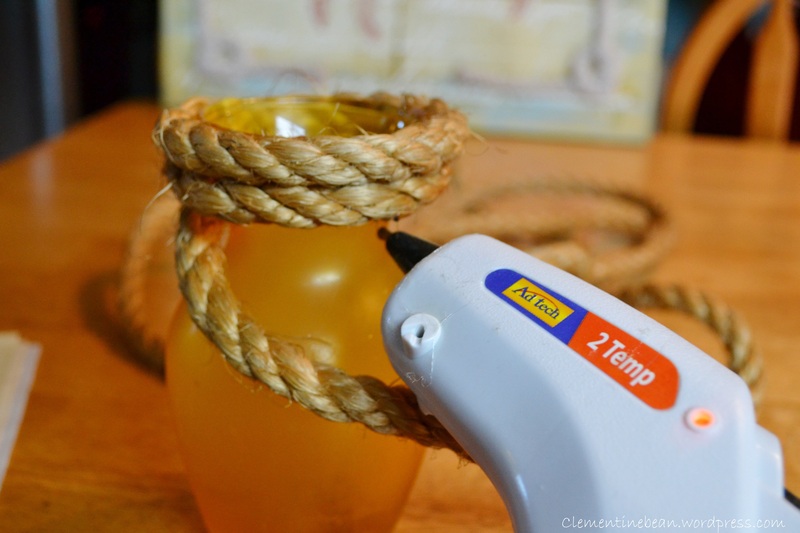 Then as I began to wrap the rope around the vase, I just put dots of hot glue every few inches. No need to put glue all the way around. 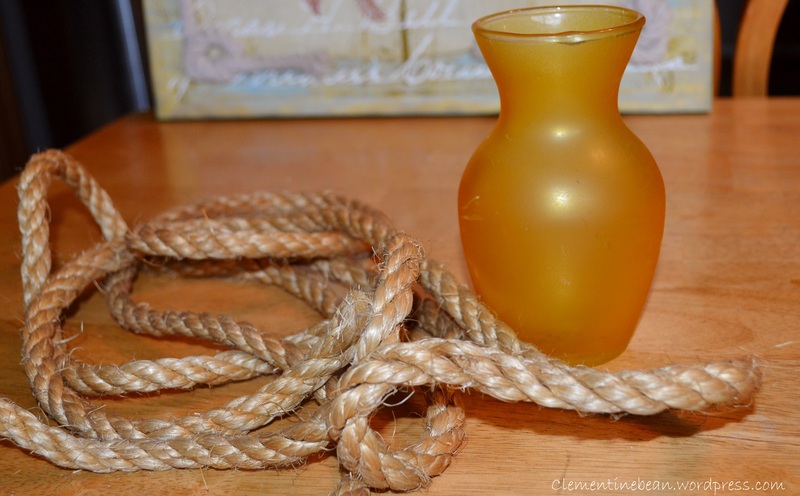 Just keep wrapping the rope around until you reach the bottom of the vase. 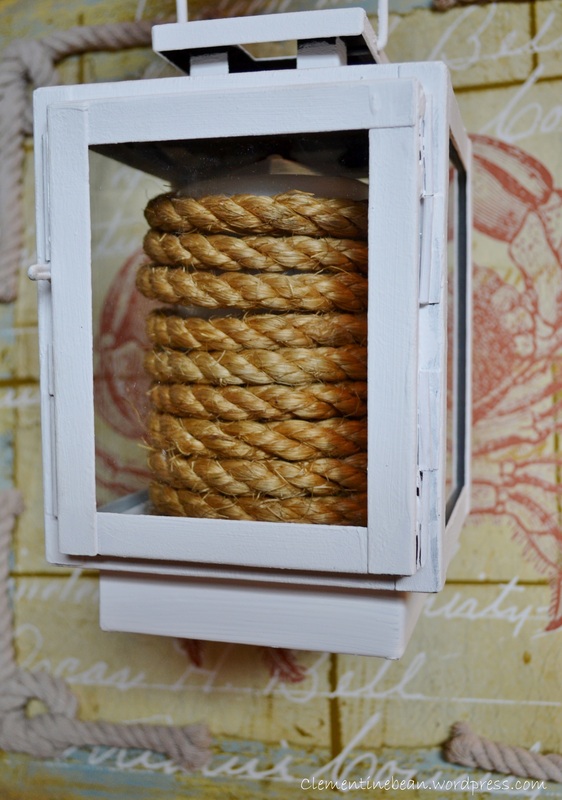 I ended up adding glue to the ends of the rope at both the top and bottom to keep it from fraying. I think it turned out pretty good! You could just leave it empty like this, or even fill it with some fresh white flowers or drift wood. Not bad for two totally free items. 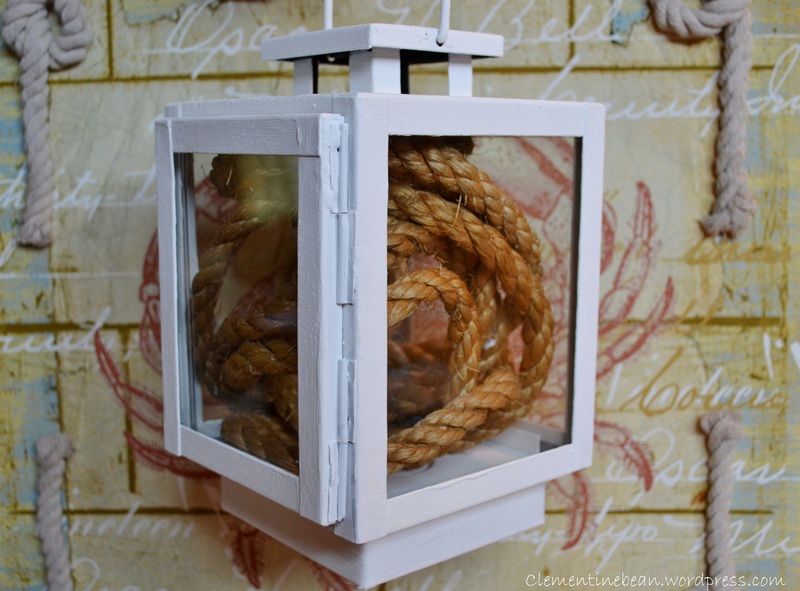 Now you’ve got a pretty little DIY nautical vase for any beach themed room. Big statement necklaces tend to be my go to accessory. If I’m not wearing a scarf, I’m wearing a necklace everyday. Since I get to them so frequently I wanted to put them on display so I am able to reach them quickly, and since I have so many I didn’t want them all on one hook. I’ve come up with this little arrangement that sits right next to the table I get ready at every morning. 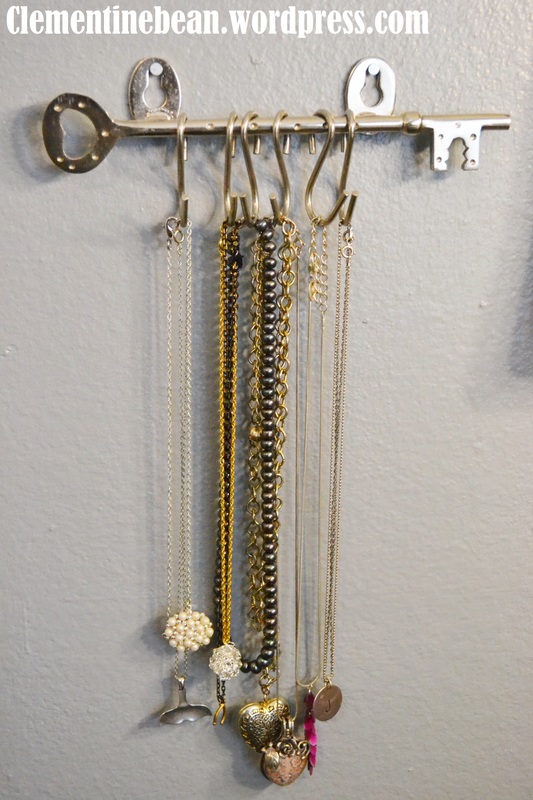 I have three hooks that I use to store my necklaces. All of them are from Anthropologie and I have accumulated them over time as birthday and Christmas presents. I use the “J” hook for my shorter necklaces. And the “C” hook for my longer necklaces. 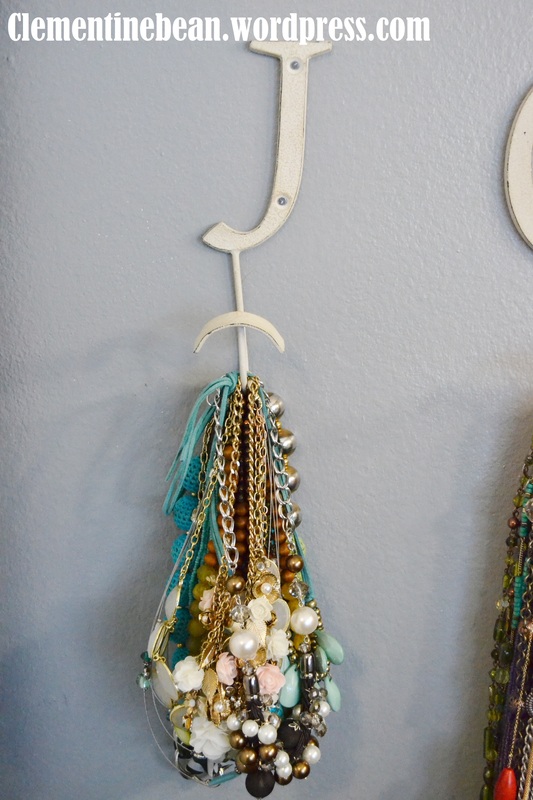 I use this super cute key hook rack for my daintier and more delicate necklaces. 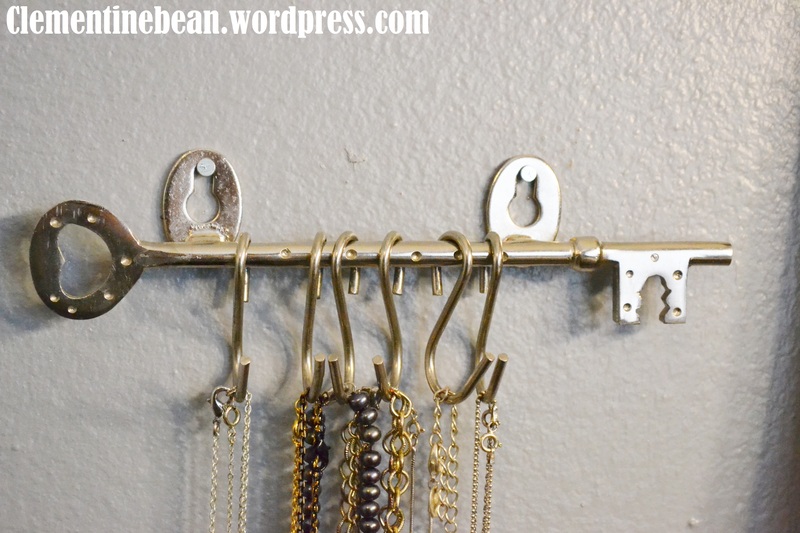 I like that this has multiple hooks on it to keep the necklaces from getting tangled. Surprisingly, my necklaces don’t get tangled on the larger hooks either. 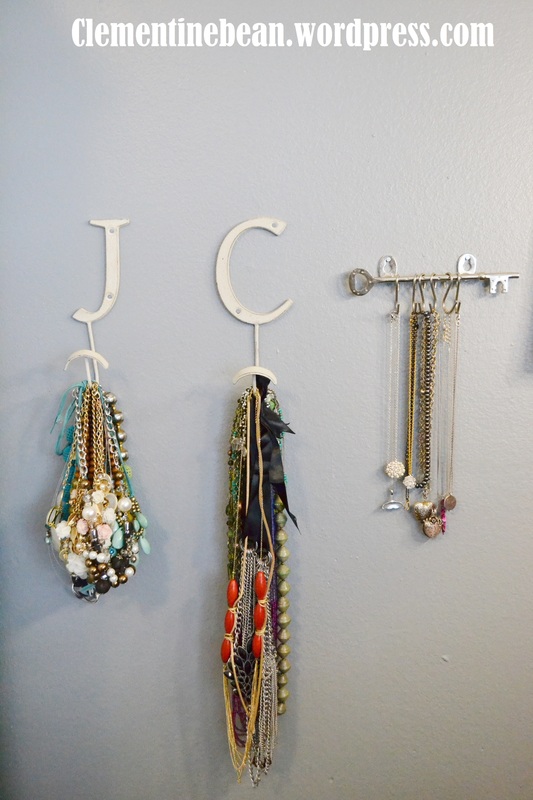 Having this where I get ready in the morning makes for easy selection and since it is right on the wall it guarantees that I put them away every night. 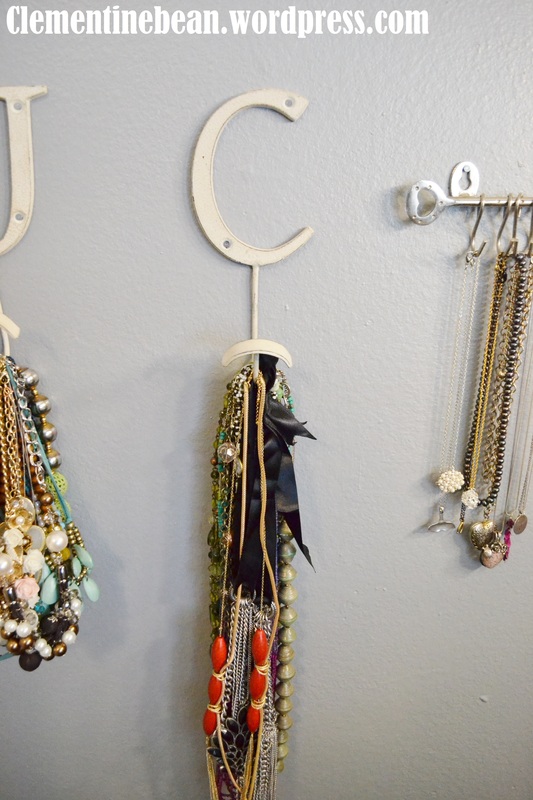 I’ve used roll up jewelry organizers before and having to take it out of my closet, unzip the pocket, put the necklace in, zip it back up, and throw it back in the closet just wasn’t working for me when I was wearing a necklace everyday. Those organizers are great for my earrings, rings and bracelets since I don’t tend to wear them very often. Now I’ve got something that not only works for me functionally, but that I also think looks really cute on the wall. 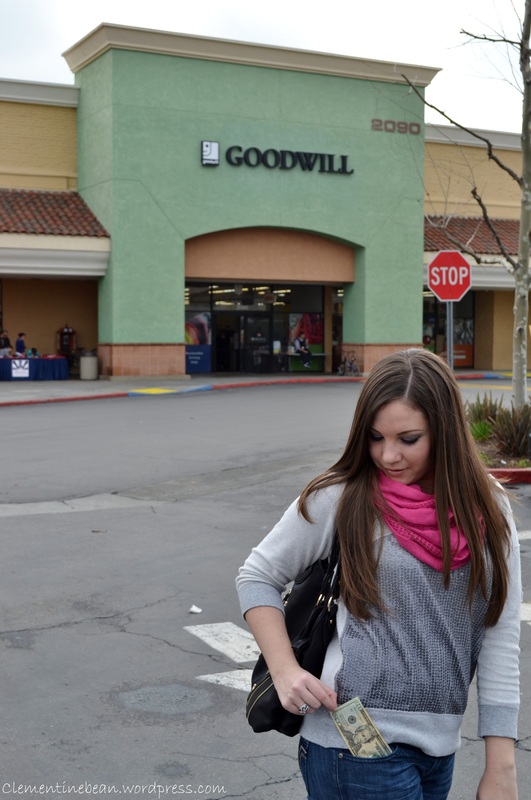 Yesterday I showed you part 1 of our Macklemore Thrift Shop Challenge. 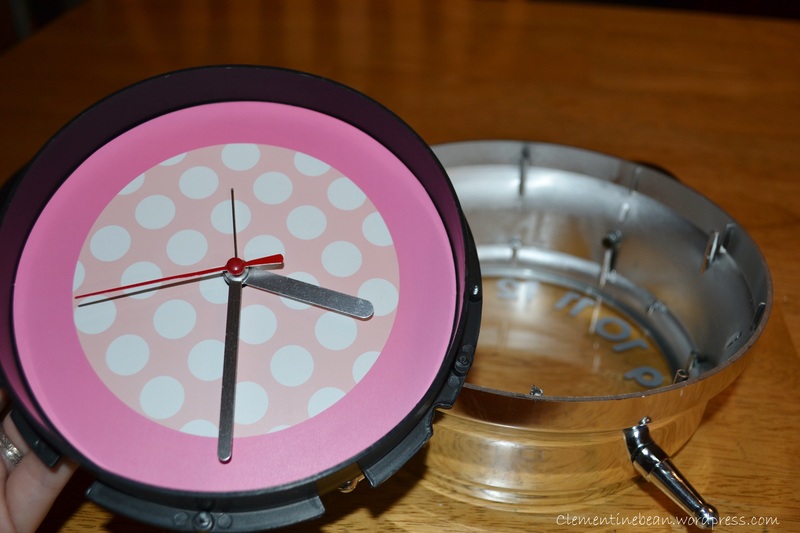 Today, in part 2, I am showing you how I redid this clock to match our bedroom. I found this clock at the local Goodwill for $2.99. I liked how big it was and I also liked the gray numbers. Our bedroom is orange and gray so I knew the numbers would fit in with our color scheme. I didn’t like the girly pink background so I knew I wanted to change that out. I unscrewed the back of the clock so I could get to the face. 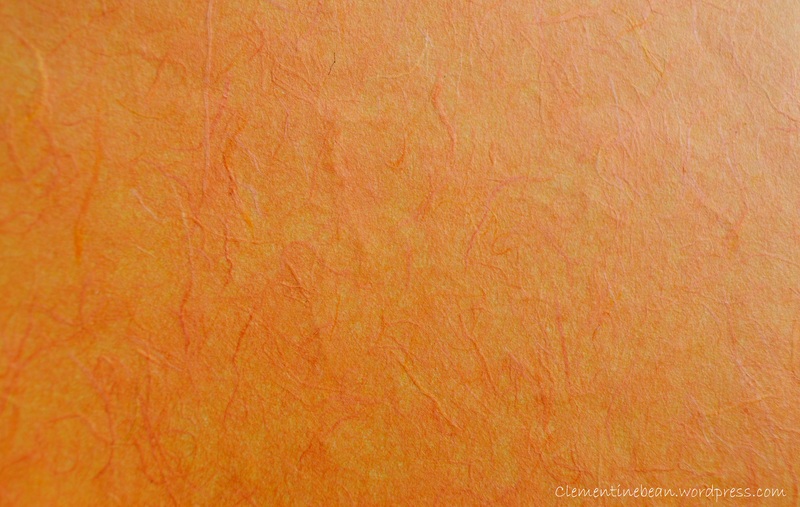 I choose this orange scrapbook paper that I got a Michael’s. 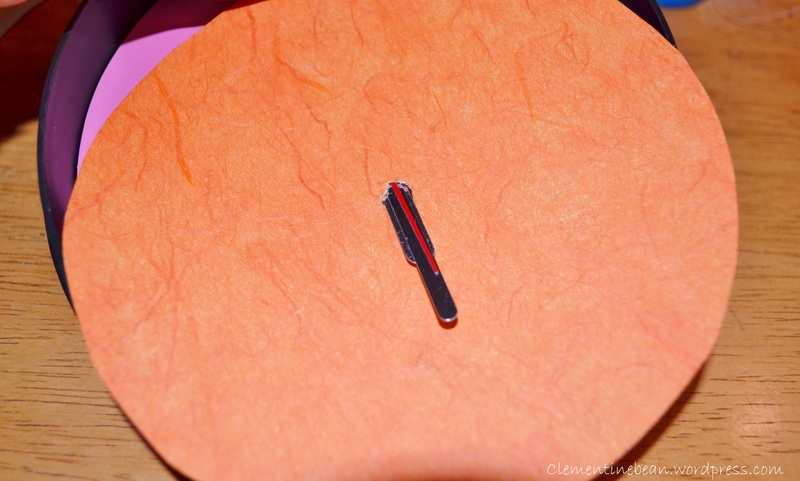 It has some texture in it with pieces of linen in different shades of orange. I used the face of the clock to trace a circle and then cut it to size. 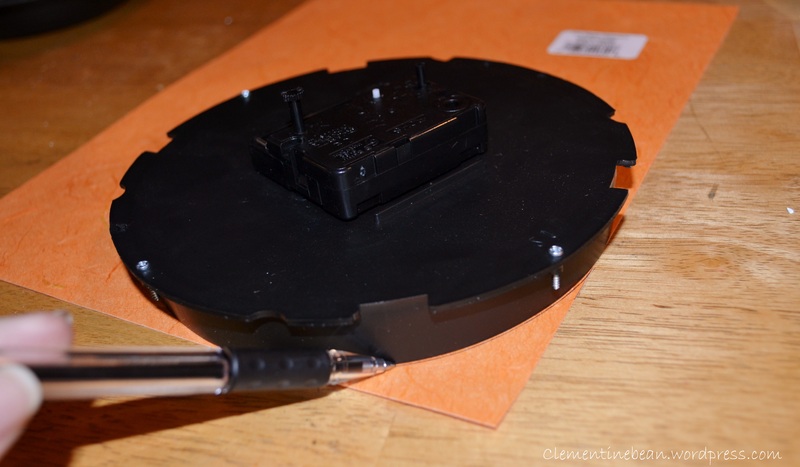 I also cut a circle in the middle to be able to place it over the clock parts. I didn’t have a hole punch that reached the center so I asked Jeff what he thought we could use to make the hole. No lie… he suggested a power drill. And we even tested it on a scrap piece of paper. It actually worked pretty good but left little tears all around the edge. We ended up just using a really sharp kitchen knife to make little cuts until we formed the circle in the middle. 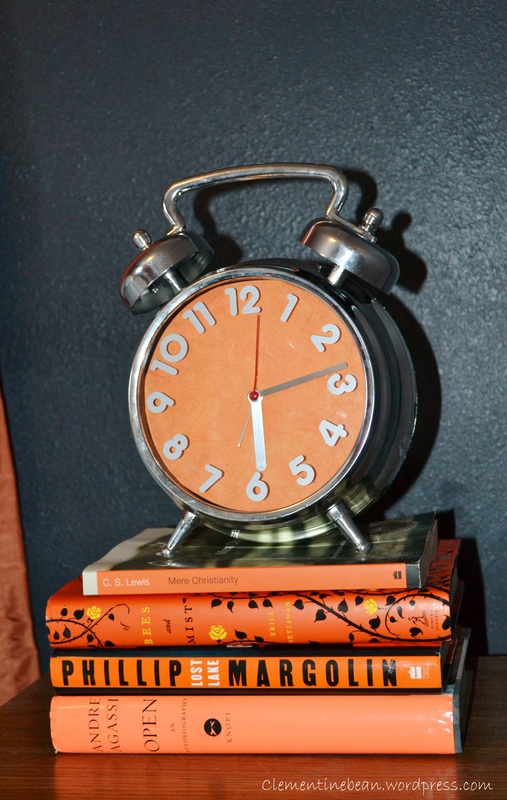 Once I had the paper in place I reassembled the clock and put it into place in our bedroom. 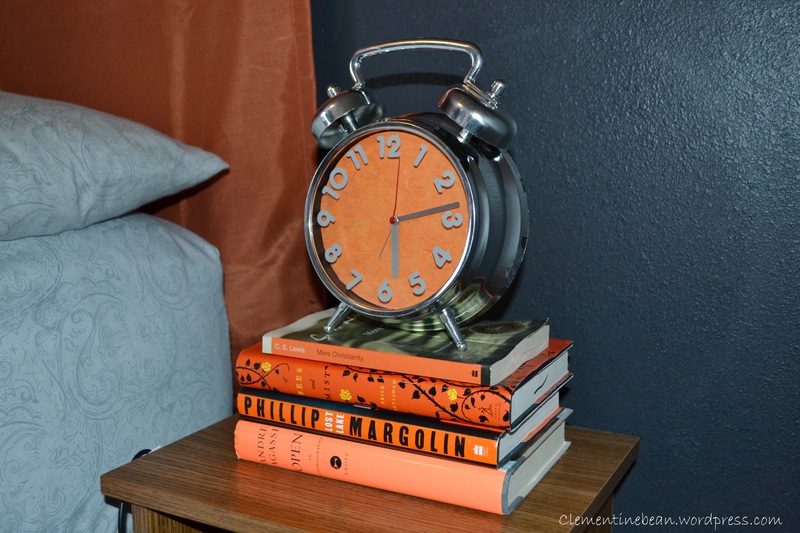 I put it on my night stand on top a stack of colorful books. I actually picked up these books at a thrift shop a few years ago just to add some color. 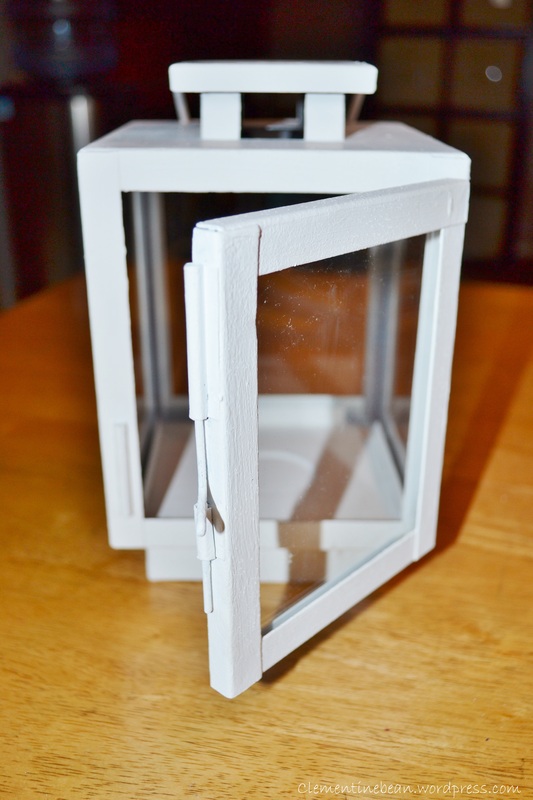 This was a super easy project and can be done many different ways. 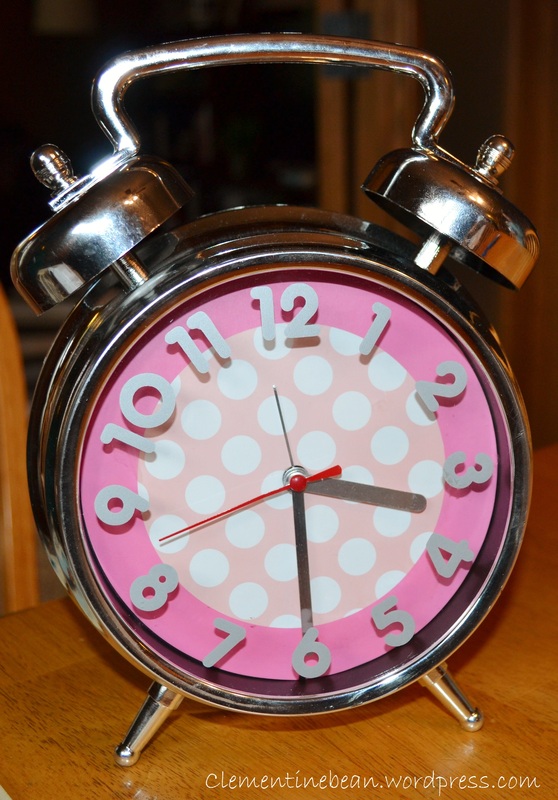 How cute would it look to put a hand written quote or even your own picture in the face of the clock? 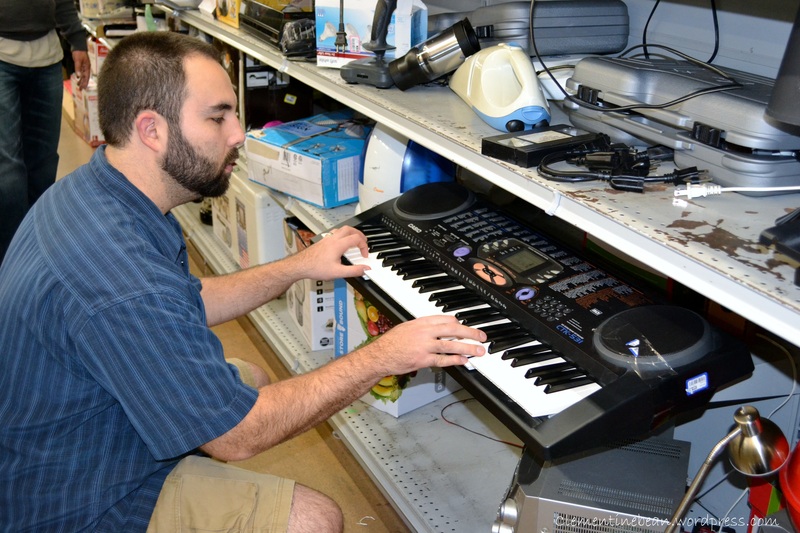 Thanks again to Young House Love for putting out the call to do this thrift shop challenge! What’s that? Is that $20 in my pocket? Let’s go pop some tags. Step #1. 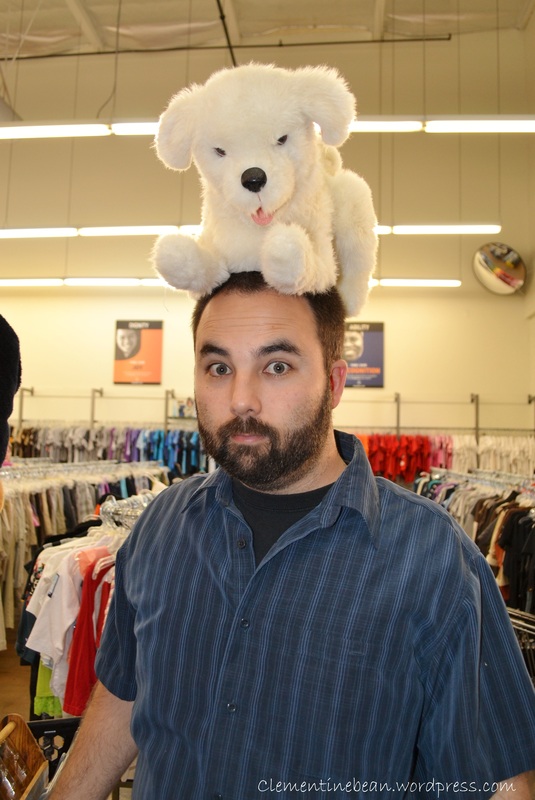 Go to a thrift shop with – just as the chorus of the song says – “$20 in your pocket”and take a picture. Snake skin, gator shoes, same thing right? Jeff was laughing at the fact that I didn’t know how to make a “no” face so this is my best passin’ up expression. 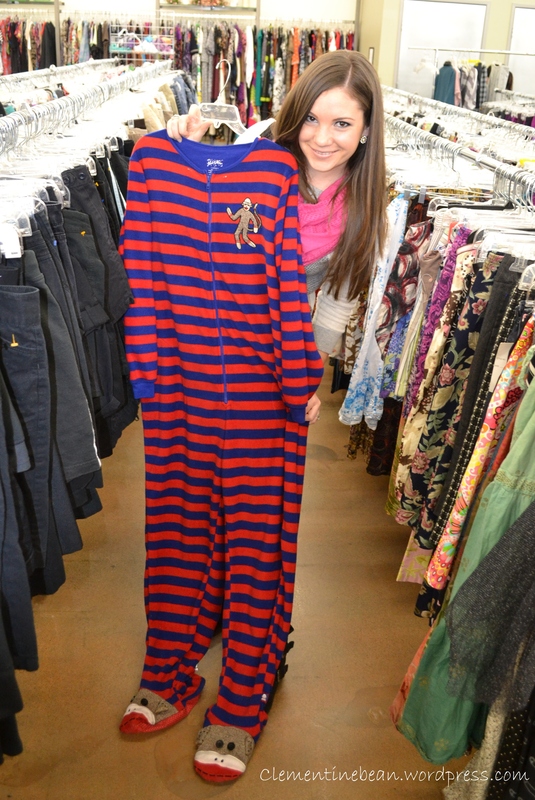 Because every good onesie deserves a cuss word when describing it. Especially one with monkeys on the feet. This was the closest thing to a wolf we could find. Close enough right? 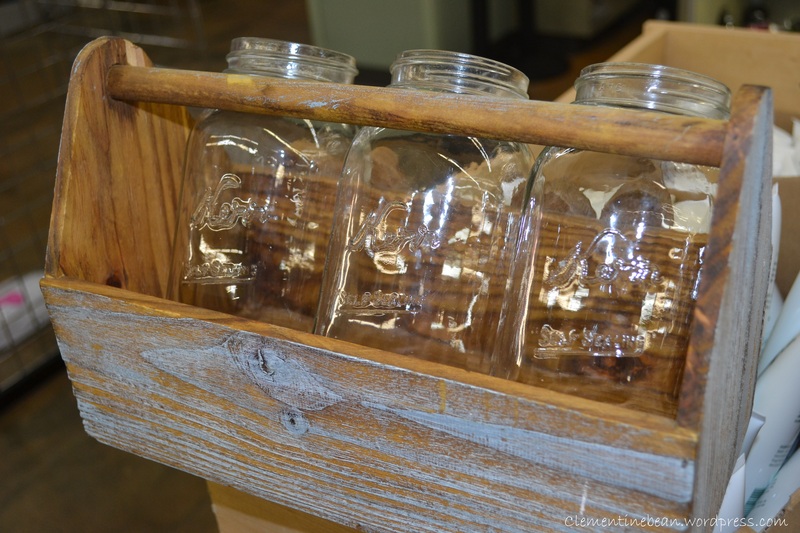 I found this wooden create, filled it with a few mason jars, and thought the arrangement looked pretty good. Only thing is, it doesn’t really match with the decor in our home so we passed on it. 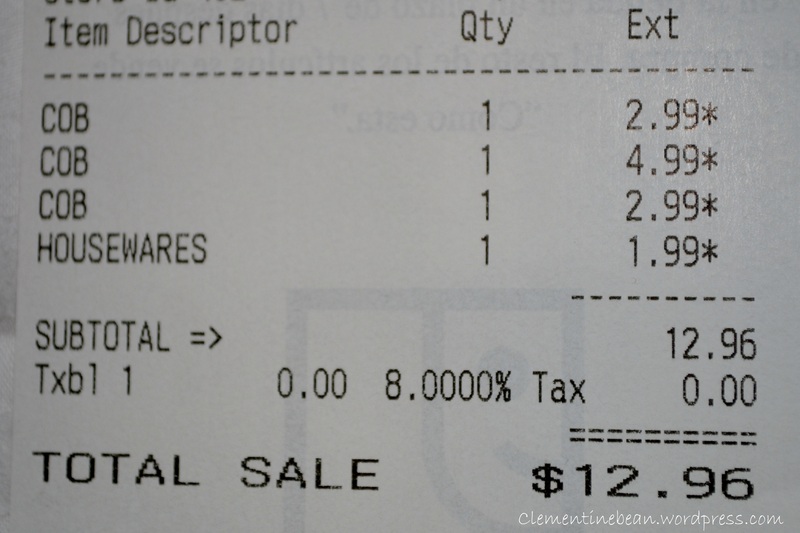 Here’s the proof that I spent less than $20 and here is what we got. 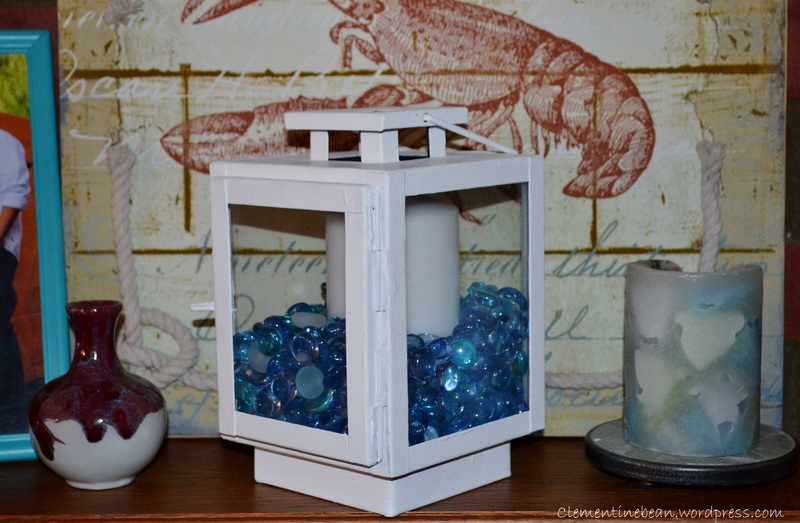 A glass enclosed lantern, a big silver alarm clock, white pillar candles and blue glass beads. 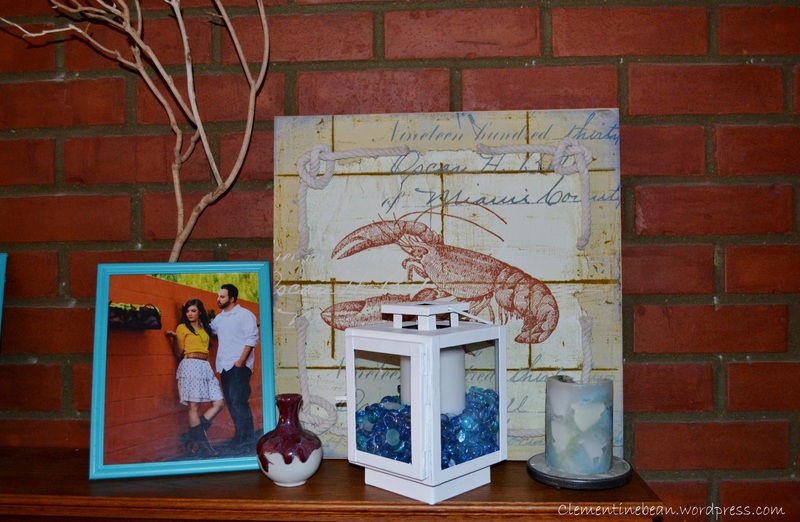 We have a nautical theme on our mantel so I wanted to make this lantern fit it. I started by painting it white. Ta-da! 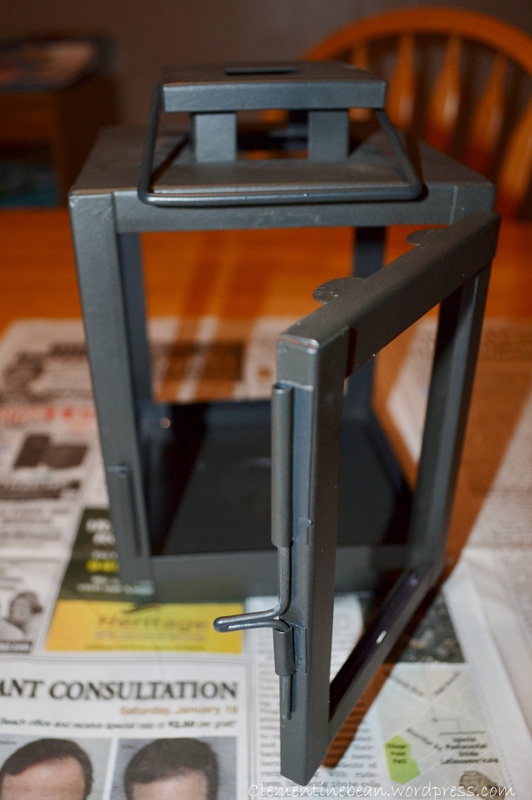 I used craft paint because that is what I had, but I would recommend using spray paint to speed things up. 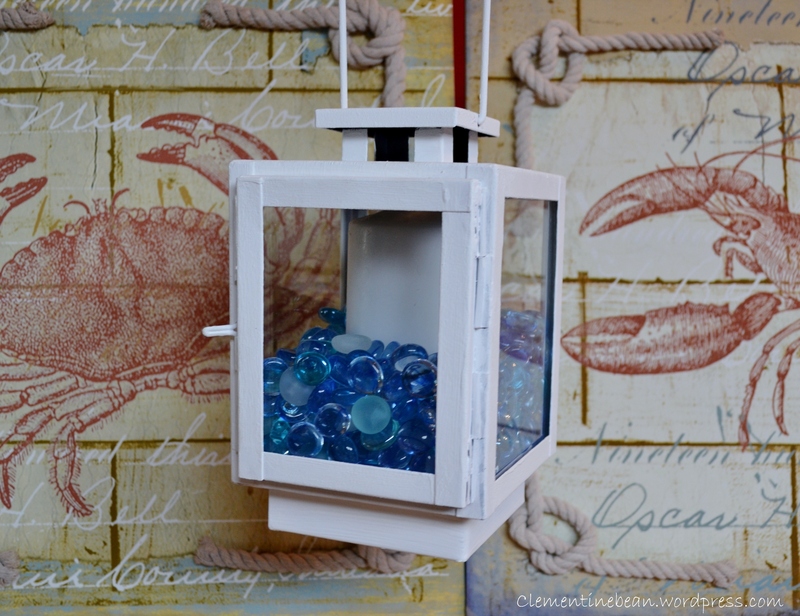 I wanted to show you a few different ways to make this look nautical. First way is just to coil up some rope and put it in. This is a more rustic and casual vibe and I really liked it. This was some left over rope that I got from my dad. When I asked him for it he told me there was special history behind it so I asked him for the story. Oh dad. You are never short of captivating stories. 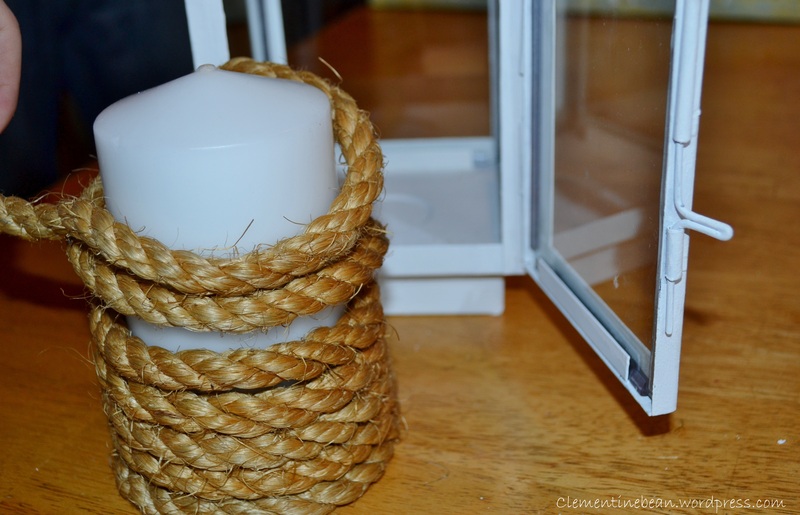 A second way is to use the rope and wrap is around a pillar candle like the one I found at the thrift store. Doing it this way is a little more clean and structured. The last way I styled it was using only the thrift store items. I put the pillar candle in first and dumped the blue glass beads around it. This is a great way to add a pop of color. So this whole project was right around $10. Not bad! 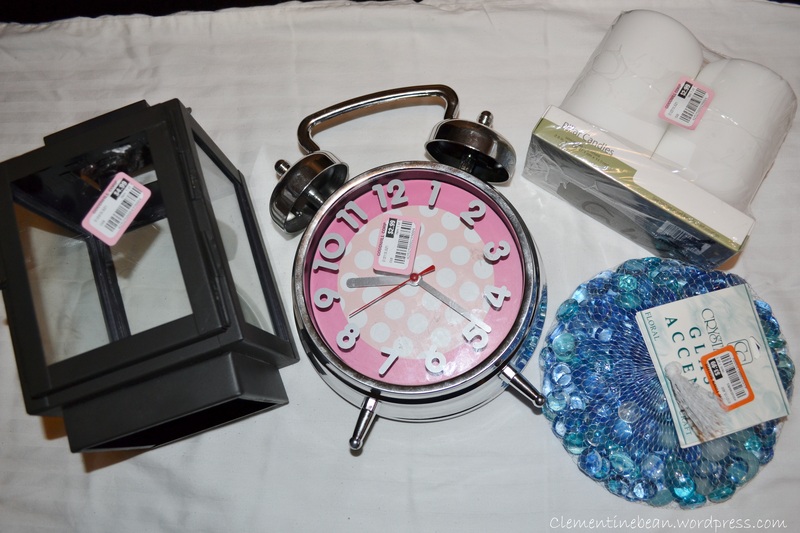 Tomorrow I will show you how I changed up the clock to match our bedroom! Update: Check out part 2 by clicking here.